A veteran of over 50 research expeditions in Antarctica, the Arctic, the Himalayas and the Tibetan Plateau, Professor Paul Mayewski is one of the world's leading glaciologists and climatologists. Also Director of the Climate Change Institute at the University of Maine, he has published over 300 papers on climate-related research and co-authored The Ice Chronicles, a book that captures the adventure of scientific research in remote reaches of the Earth and relates important new breakthroughs in the understanding of climate change. In this interview, Professor Mayewski answers questions about the difference between natural and human induced climate change, as well as about the potential severity of the human impact on global climate. We live in an interglacial period, but the Earth has also recently come out of what is known as the Little Ice Age. Can you explain? Everything is a matter of perspective. For example, in the last million years, only 10% of the time has climate been comparable to the mild, or interglacial period we are experiencing now. So the past 10,000 years - the period during which human civilization has evolved - is relatively unique. The other 90% of the time has been notably colder. However, within these last 10,000 years, there have also been shorter cool periods known as "mini ice ages", when temperatures dropped and mountain glaciers advanced. The most recent of these started in the Northern Hemisphere around AD 1400 and corresponds to what some people call the Little Ice Age. It ended between 1850 and 1900 when glaciers started to retreat again. 1850 to 1900 corresponds to the beginning of industrialization. Did the Little Ice Age end as a result of natural fluctuations, or was it linked to human-induced global warming? With regard to atmospheric circulation and temperature of the past, typically whenever temperature changes in the natural world, atmospheric circulation patterns change at the same time, or even earlier. But what we've found is that the atmospheric circulation patterns today are still largely within the range of variability of the Little Ice Age despite the fact that temperature has risen notably over the last few decades. This indicates that the modern day changes in climate are not operating like the natural climate system. Over the last few decades, because of human activity, global temperatures have been unnaturally forced into a new state, while circulation patterns have in general remained the same, so what we're doing is imposing warming on a world that would actually like to still be cooler, more like the Little Ice Age. The bottom line is that we have created a very unstable situation. The world would actually like, based on its natural state of variability, to be a little bit colder, probably closer to Little Ice Age conditions. A lot of people might say, "That's great! Global warming can be offset by the natural climate system..."
What we're doing is overpowering the natural climate system by superimposing warming on a period that would rather be naturally cool.We're pushing ourselves into a less and less stable climate. And we are gradually moving from a climate that is primarily forced by natural activity, to one that is being increasingly controlled byhuman activity. Is it possible to quantify that as a percentage? Off the cuff, I would say that we have gone from the influence of humans on climate being perhaps just a few percent at the onset of the Industrial Revolution, to gradually 40%, 50%, even 60% over the last and near term decades in terms of temperature - and it could easily jump into a much higher percentage. It is important to remember also that the impact of human versus natural forcing on the climate system varies by geographic location. If humans were not affecting the atmosphere and the Little Ice Age had continued along a natural cycle, when would you have expected it to end? If you look for an analogue in the natural system, these events typically last close to 1,000 years. So far, this one has lasted 600 years. The Little Ice Age might have easily continued until 2400 AD or beyond. This all leads us towards a major aspect of your work, which is "abrupt climate change". Can you explain what it is? When drilling ice cores in Greenland in the late and 1980s and early 90s we were able to validate a theory that climate systems did not always change slowly over thousands or tens of thousands of years, but that they also have the ability to change very abruptly. And not only did we validate the fact that they could change abruptly, but we shocked ourselves in just how abruptly it can change. In places like the North Atlantic, which happens to be a place where abrupt climate change is particularly dramatic, there were changes on the order of several degrees centigrade in a matter of less than ten, and arguably less than two years. The new climate state could then be sustained for several hundred years, before going away just as fast. 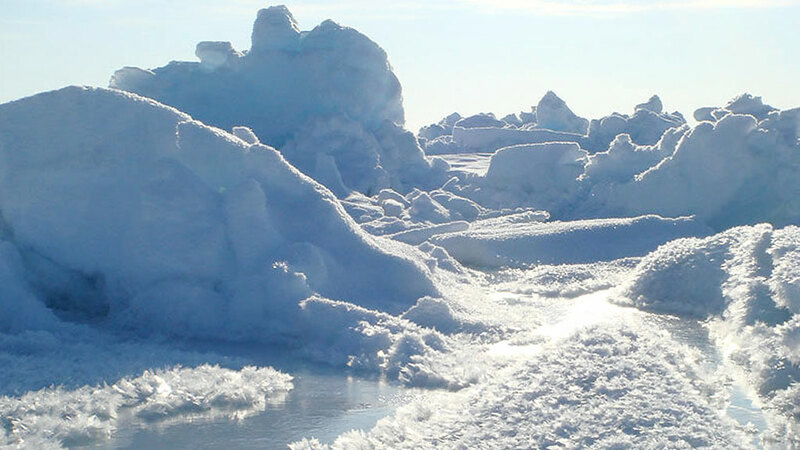 When the Northern Hemisphere was covered by significantly more ice than it is today, more than 20,000 years ago, these events were even more dramatic in magnitude, because they were amplified by large white surfaces and the oceans were more extensively covered by sea ice. As you get to the milder climate of the last 10,000 years, abrupt climate change events still occur, but they are much smaller. And we found that some of them are regularly spaced - every couple of thousand years - whilst some are more anomalous. Some are very closely aligned with major disruptions to ecosystems and civilizations. Over the past 10,000 years of climate change in the Northern Atlantic, the time periods during which Arctic sea ice was at its greatest minimum, other than today, was about 4,200 years ago. That coincides exactly with the collapse of the Mesopotamian Empire, and a massive period of drought, from the Middle East into Eastern Asia. Other large scale human events which coincide with abrupt climate change events include the collapse of Mayan Civilization, and the collapse of the Norse colonies in 1400 AD. This doesn't mean that abrupt climate change was entirely responsible for these major human events, but it certainly was a major component. So you are suggesting that this could or will happen again? The scary thing is that the natural events that have triggered climate change in the past were sometime relatively small: tipping points. Now that we are in a situation where human source emissions of greenhouse gases are going crazy, and in which both decreases in ozone over the Antarctic and Arctic and increases in tropospheric greenhouse gases are occurring simultaneously, we are effectively overpowering the natural climate system. And as the climate system forces in the other direction, we are increasing the probability of abrupt climate change even more. We're perturbing the climate system so fast that there is no reason to assume that it won't be forced into a new state again, or that future changes ought to be nice and linear. Do you expect this to be global, or do you expect it to be more specific to the Northern Hemisphere, or perhaps even to the North Atlantic? From what we know, the most dramatic expression of the naturally forced expression of abrupt climate change events tends to be in the North Atlantic, but we also know that abrupt climate change events are globally distributed. I'm sure that the North Atlantic will be one of the places more severely affected, but you could make the case that the ongoing drought in Australia could be pushed into an abrupt climate change event as the polar vortex around Antarctica begins to shrink and the moisture bearing winds that go into Australia are pulled away. So there could be very dramatic changes in precipitation, temperature, atmospheric circulation patterns that could suddenly kick Australia into a new state. But it's one thing to look back in time with perspective and see these events, and quite another to be right at the beginning of such an event and to have the appreciation of where it's going. And what about sea level rise? There is also no reason to assume that sea level will rise gradually. In fact, if anything, the sea level rise will probably be abrupt. It could be massive - portions of Greenland and Antarctica suddenly adding to sea level rise. Two of our colleagues at the University of Maine, Gordon Hamilton and Lee Stearns, have done a study of just two glaciers on the east coast of Greenland, and the volume loss of just these two glaciers in the last five years accounts for 10% of the sea level rise for those five years. That's a dramatic statement. Especially if you consider that although they are large for the East Coast of Greenland, they are not at all the largest glaciers in Greenland. There are much bigger ones on the West Coast. So this suggests that sea level rise will not be gradual, but will occur in spurts? To assume that climate will not change abruptly would be very foolhardy. I think that all predictions should take into account this extreme possibility of abrupt climate change, because I would bet money that it will occur some place and some time within the next 50 years. But of course, to predict when it might occur is not so easy. Director of the Climate Change Institute at the University of Maine Professor Paul Mayewski is one of the world's leading glaciologists and climatologists. A veteran of over 50 research expeditions in Antarctica, the Arctic, the Himalayas and the Tibetan Plateau, he has published over 300 papers on climate related research, and is the co-author of The Ice Chronicles, a book that captures the adventure of scientific research in remote reaches of the Earth and relates important new breakthroughs in the understanding of climate change.